Overview - The fate of an empire rests on the shoulders of one man. Academy Award winner Russell Crowe commands the screen in this spectacular, high-seas adventure directed by Peter Weir. After a sneak attack by a French warship inflicts severe damage upon his vessel, Captain "Lucky" Jack Aubrey (Crowe) is torn between duty and friendship as he embarks on a thrilling, high-stakes chase across two oceans to capture or destroy the enemy at any cost. "Though we be on the far side of the world, this ship is our home. This ship is England." With modern cinema's emphasis on spectacle over substance, where bloated hyperactive action scenes have largely replaced such old fashioned notions as plot or character development, it's rare to see a film that could truly be described as "literary" in recent years. Even movies adapted from books tend to start with the pulpiest of bestsellers, the sort written virtually in screenplay form as test runs for their authors' Hollywood ambitions, and then further dumb the content down by the time it gets to screen. 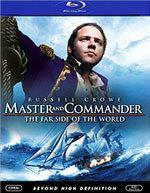 Thus Peter Weir's extraordinary 'Master and Commander: The Far Side of the World' was truly a pleasant surprise. Not that Weir, the talented filmmaker behind the classics 'Picnic at Hanging Rock' and 'Witness' would be expected to churn out a mindless rollercoaster thrill ride. What's amazing is that he convinced three major studios (the film was a co-production between 20th Century Fox, Universal, and Miramax) to invest a huge budget in a historical naval drama with only two notable action scenes bookending two hours of thoughtful dramatic developments in between. The movie is adapted from the Aubrey-Maturin series of novels by author Patrick O'Brian, which ran 20 volumes in all. Characters were taken from the first book 'Master and Commander', but the plot was drawn primarily from the tenth entry 'The Far Side of the World', with bits and pieces borrowed from several others. The result is true to the spirit of the author though specific details and settings have been altered to seamlessly blend into one coherent narrative. The story concerns Captain "Lucky" Jack Aubrey (Russell Crowe) of the HMS Surprise, a Royal Navy battleship at sea during the Napoleonic Wars, ordered in pursuit of the French privateer vessel Acheron, a faster, heavier, better armed ship out of the Surprise's class. A selfless leader and brilliant tactician, Aubrey must not only chase the Acheron through the dangerous waters around Cape Horn into the Pacific Ocean, but must match wits with his friend Stephen Maturin (Paul Bettany), the ship's doctor and Naturalist who acts as the Captain's voice of conscience when a dedication to duty and honor develop into obsession. The eerie opening sequence brilliantly sets the tone, slowly and quietly introducing us to the ship and the men who run her. In the early morning hours, a vague shape is spotted in a fog bank miles ahead. The officer on watch is unsure of what he's seen and hesitant to order the ship to battle readiness. The Captain is called to deck. With patience (and perhaps a little annoyance), he surveys the scene and orders the crew to stand down until, suddenly, flashes of light appear in the fog. Cannon fire, the blasts are seen before they're heard. The ship is barraged with artillery and an incredible battle commences, the Surprise and Acheron pitched in fevered combat. The two ships draw close and nearly tear each other to pieces before Aubrey manages to use the confusion of the fog to outwit the enemy and slip away to regroup and repair. While the movie has only one other, climactic battle of similar intensity toward the end, the details of life aboard the Surprise are equally fascinating. Weir retains O'Brian's immersion of Naval jargon in the dialogue, allowing the context of scenes to explain meaning without necessarily hand-holding the audience through definitions of every term. We learn of Naval procedures and operations, and the importance of civility and decorum among the crew comprised of boys as young as 12 years-old to grizzled seamen much older than their Captain. Rituals and seemingly superfluous tasks such as repairing cosmetic damage after a battle (when the ship itself has barely stayed afloat) play a critical role in maintaining discipline and morale. The world seemed a much larger place in the early 19th Century, and this small, fragile wooden boat was all the protection these men had from the vast expanses of ocean around them. Yet they were charged with what they believed to be the very fate of the world were they to fail their mission. Crowe and Bettany deliver terrific performances. The script is literate, intelligent, and thrilling both intellectually and viscerally. Weir's direction is accomplished, putting every penny of his budget on screen and utilizing the latest in visual effects to realize this classical tale in convincing detail. 'Master and Commander' is among the best that Hollywood can offer, a perfect blend of expensive production values matched with a story worthy of their effort. 'Master and Commander: The Far Side of the World' comes to Blu-ray from 20th Century Fox Home Entertainment, who were nice enough to let the disc load the main menu right away without any annoying promos or trailers first. Unfortunately, they haven't attempted to replicate the package art from the lovely 2-disc Collector's Edition DVD, instead recycling the quickie Photoshop job from the single-disc DVD for the Blu-ray cover. The DVD edition of 'Master and Commander' had a pretty impressive transfer for the Standard Definition format, and this new 1080p/AVC MPEG-4 Blu-ray (again presented in the film's proper 2.40:1 theatrical aspect ratio) looks very similar. Not, "It looks like the same transfer with a much higher resolution image." No, watched back to back, the two discs look basically the same, with only a slight perceptible improvement in detail on the High-Def disc. The Blu-ray has fewer artifacts and less edge ringing than the DVD, for an overall more stable picture, and when compared directly will indeed show somewhat more fine object detail, but the upgrade is a minor one and quite disappointing. The movie has some intentionally hazy photography, with many scenes in fog or mist. That will tend to soften the picture, but even bright daylight scenes such as those on the Galapagos Islands demonstrate a pronounced lack of crispness or clarity. The image has the appearance of having been run through Noise Reduction processing and then artificially sharpened to compensate. Edge ringing is fortunately minor, but textures are often a bit gritty. There are sequences in the movie with incredibly heavy grain, including the opening battle in the fog bank. That's deliberate and not a knock against the transfer per se, but film grain tends to look sparkly and noisy due to the way it's been digitized and processed. Colors are also muted by design. None of this is to say that the Blu-ray looks terrible, but it doesn't exhibit the significant upgrade over DVD that was expected. The movie won an Oscar for Best Sound Editing and was nominated for Sound Mixing as well. The DTS track on the DVD was a knockout, and the Blu-ray's lossless DTS-HD Master Audio 5.1 track likewise brings the house down. The mix is incredibly immersive from start to finish, during quiet scenes and battles alike. The entire soundstage is constantly active with creaking and groaning noises of the ship, or the sounds of water lapping and sloshing with pinpoint directionality from the sides and rears. There are even a couple of instances where I swore that the tromping of feet on the upper decks came from the center of my ceiling. Though technically only encoded as 5.1, when decoded with ProLogic IIx processing the track will give a full 7.1 speaker configuration quite a workout. When the battles rage, thunderous cannon fire tears through the room from front to back, wood splintering in every direction upon impact. The bass is punishing, yet always clean and precise. If I have any small complaint, it's that the surround channels are sometimes a bit too loud and attention-grabbing, when a little subtlety may have been more effective. Dialogue can also get drowned out by the atmospherics, especially in the loudest sequences. Regardless, the 'Master and Commander' soundtrack is a stunner, and exactly the sort of thing that home theater was made for. Back in 2004, Fox released 'Master and Commander' in two separate DVD editions, a single-disc with no bonus features of note and a deluxe 2-disc Collector's Edition loaded with supplemental material. The Blu-ray splits the difference, offering just a taste of the better DVD's content. Deleted Scenes (SD, 24 min.) – Listed as six scenes, this collection of extraneous footage is more accurately described as a series of themes, primarily focused on random snippets of life aboard the ship and unused vanity shots of the boat at sea. The footage is interesting, but there are no dialogue passages of consequence or anything that directly affects the plot of the movie. The audio quality is also very poor. Theatrical Trailer (HD, 3 min.) – This cheesy "inspirational" trailer is one of the weaker ads for the film. Although presented in High Definition, the spot is cropped from the original aspect ratio to 16:9. 'Master and Commander: The Far Side of the World' is a terrific movie but, like many of Fox's catalog titles on the format, the Blu-ray edition is something of a mixed bag. While the soundtrack is stunning, the video quality is only a small improvement over the DVD edition. The supplement package has also been significantly stripped-down from the much more impressive 2-disc DVD set, and the new interactive features don't amount to much. The disc merits a recommendation, but owners of the Collector's Edition DVD will want to hang onto that as well.